and then to the Oregon Coast. It was a beautiful drive down the coast to so many of the places we love. And then we arrived at our hotel. The marine layer had set in so there was no beautiful sunset, and the air was humid and was starting to chill. The hotel was a little more dive-y than I remembered, but it’s a king sized bed with an ocean view and a fireplace and the man I love, and who can really complain about that? our restless souls found it hard to JUST BE. This week my goal is to not try to fill every minute with busy-ness. Right now I’m purposely lying in bed writing this as opposed to rushing around to get ready. We have all day. The sound of the ocean outside my door, the waves crashing within my sight. I brought four books but I haven’t cracked one. I want to be still, relax, read, write, take in the beauty of where I’m at, and allow my soul to refresh and recharge. It’s a learning process for us both. *Background info: In the past 8 months, there have been many changes in my life. I became an empty-nester. My husband got a new job. Actually, he got one job, then was promoted to another. I sold our home where we had lived for 13 years. I moved away from the Pacific NW, where I have lived all of my life, to Louisville, Kentucky, 2300 miles away. I quit my job as a hospice nurse. I became unemployed (by choice, but still, unemployed). We moved to a new part of the country, a new city, a new house, a new church. I’m so absent-minded lately, my husband is afraid I have early on-set Alzheimer’s. I lose my way when I drive to the health club. I leave for an errand and come back without the item I was supposed to get. I ask my husband repeatedly about the dates he is going out-of-town. I leave eggs boiling on the stove until they almost blow up (it’s not as cool as it sounds). I remember once my kids were convinced that I had early dementia. I was so scattered, I was almost convinced, too. So I made and appointment with a doctor friend of mine who is an expert in the area, and after some testing, she assured me that what I was dealing with was just stress. She told me that if you are stressed or sleep deprived, you can exhibit similar symptoms. However, this was the best test – If you forget where you put your keys, that is normal. If you forget what your keys are used for, that is not normal. And on top of that, I have become a wishy-washy mass of insecurity. I have little to no sense of self or where I belong, and I have lost my sense of purpose. An acquaintance recently asked me, “What do you do?” I am currently not working, so she asked me “Well, what do you like to do? Do you have any hobbies?” I started blankly at her. WHAT? WHO is this person? What made me become this shaky leaf of insecurity? And I miss the old me. I miss being able to have dinner with my kids. I miss the woman who worked hard as a hospice nurse liaison to make sure her patients were well-informed and well cared for. I miss supporting my colleagues, working shoulder to shoulder to advocate for our patients. I miss being an expert in my field. I miss my tribe of women, whom I purposely gathered over the years – women with whom I could share my heart, who would pray for me, cook with me, or just come sit and talk to me while I did my dishes. I miss feeling like what I was doing on a daily basis was purposeful. I miss the structure. I miss familiarity. I don’t like feeling so uncertain all of the time. I don’t like having all of this time to fill, but I also don’t want it to be filled. I’m tired and feeling lost and out-of-place all of the time. I’m tired of feeling lonely. I’m tired of having one small incident – like getting looked over for a job, or having someone not return a text – shape my whole day. And honestly, I tire of hearing myself whine about it. (You are probably tired of hearing about it, too). As a matter of fact, I hate even writing about this, but it was one of those times I just have to vent or go crazy. So I’m not going to post this blog on social media. I am just writing for me. So if you have somehow stumbled upon this, you were meant to be here. This is one of the few times I will leave open the comment section, so if you’re reading this, I’d love for you to leave a comment. It’s coming up on one year in just a few months. I thought things would be settled by now, figured out. I thought I would have a sense of community, a structure, a sense of purpose. I just want everything to feel okay. Some days it does, but honestly, most days it just doesn’t. And to be really honest, not all of this has to do with the changes that have happened in my life. I could just as easily be feeling this way back in the Northwest. I would just have work and friends to distract me. In any setting, I am a seasonal person. And I know this is simply a season. Mindful breathing when I first wake up. Eating well, getting enough sleep, exercising. Looking at what I am feeling, discerning what is a lie and what is the truth, and being thankful for what I have. And I am finding what I am lacking the most, and what I am in deepest need of – time with God and remembering who I am in Him. Being okay with where I am because he has brought me here for a reason. I find that I am often drifting down the stream and entering into a spinning whirlpool before I remember that I have had a lifeline all along. Lord, I need help. I know that as I look back on my life, I’ve learned the most from times of struggle, when I am pushed out of my comfort zone and am learning to rely on you, to love you in a new way, and to let you love me. Those times are what has made me life so much richer. Be with me, give me peace and strength and joy. Help me to reach out and be your loving touch to those around me. Help me to embrace this vulnerable season. Day One and Two completed, I thought things were going pretty good. I had gotten into a routine of making my smoothies for the day in the morning, planning out my snacks, making sure I had boiled eggs, and measured out my three liters of water. My husband was out of town on business, and that made it easier to make good food choices – I didn’t have to worry about fixing him dinner, I could put away all the food that was tempting me, he wouldn’t bring home anything that would be tempting, and I wouldn’t have to smell anything that he was cooking. Easy-peasy. As day three went on, the house was quiet. I ran a couple of errands, and realized how often I grab a snack here and there when I’m out and about. I resisted the urge. I moved to a new town this past summer, and I had just returned from a trip back ‘home’, so I started thinking about how I missed my friends. I started to feel sad, and it was amplified because I knew my husband wouldn’t be home for a few days. I texted a couple of people, but they didn’t text me back. I felt so lonely. And I really wanted to eat sugar. I hadn’t realized how much I use food as a distraction or comfort. I know that I do that, but I didn’t KNOW how much until I didn’t have that option. Each time I had a craving or really wanted to eat, I stopped to ask myself WHY? I wasn’t hungry – the smoothies on the cleanse were very filling, and I had the allowed snacks if I was hungry. So for two days, day three and four, I became more and more depressed, lonely, distraught. I had to stop and look at what was going on – and realized . . . This is what happens when you take food away from a food addict. When you aren’t distracting yourself or comforting yourself with food, guess what? You actually have to FEEL. I had been avoiding feeling for longer than I realized. Researchers at Yale University’s Rudd Center for Food Science & Policy have developed a questionnaire to identify people with food addictions. There are schools of thought regarding the emotional and physical signs of food addiction and it’s relation to eating disorders, but this essay is about my personal experience, so I’m not going to delve into the science and psychology of it. You can google it. For myself, when I am using food for something other than nourishment, compulsively using food as a distraction from physical or emotional pain, out of boredom, or as a replacement for dealing with stress, loneliness, or anger, then I am acting as a food addict. Other definitions include being unable to stop the compulsive behavior, despite negative consequences. Like weight gain, or health issues, or spending money. So day three and four ended up to be a 48 hour meltdown. I felt bored and lonely and hopeless. I was ready to tell my husband that I can’t stay in this new town. What was I thinking moving here? Do you know how hard it is to meet people when you don’t have school age children and you aren’t working? I have met some people here, but none I know well enough to call in the middle of a meltdown. I was afraid I’d cry on the phone. It was a tough couple of days. My husband came home and I cried on his shoulder, and then I went to church and cried on the pastor’s shoulder. He promised to connect me with the other two women in the church that are my age (its a small church). But I stuck to the cleanse. Partly because I didn’t want to fail again, partly because I know it was due to my sugar withdrawals, and most of all, because I want to be healthy. The despair waned, and I made some healthy choices in the middle of it. I talked to my husband about how I was feeling. I found a women’s group at a large local church that is specifically for people who have recently moved to town. (The group had already been meeting for a few weeks, but I told them I was desperate so they let me in.) I connected with someone I would like to be better friends with and made a date to get together.I texted my friends back home and received their love and support. I asked people to pray for me. As for the rest of the cleanse, I finished all 10 days. I got a horrible headache on day 8, but I wasn’t hungry and the smoothies tasted so good that once I got past the cravings it was actually pretty easy. Although they say most people lose 10-15 lbs, I lost 8 lbs, but I am fine with that. I find now that I am over 50, I can’t just drink extra water and lose 5 lbs overnight like I used to. I don’t feel tired, I don’t have a headache, I’m not bloated or gassy, my brain isn’t as foggy, and my joints aren’t as stiff. I haven’t had sugar, processed foods, caffeine, or alcohol for 10 days, and my body is loving it. Also, as someone who had diverticulitis so severe I required a bowel resection, my gut is feeling GREAT! Now the challenge is what to do next. Today is the first day off the cleanse, so the book suggests adding whole foods gradually over the next three days. My meals today were two green smoothies, two hard-boiled eggs, cashews, and a dinner of spaghetti squash and homemade marinara without meat. (Here is the recipe for the marinara sauce.) It tasted absolutely delicious! I started to go for seconds out of habit but I stopped and asked myself and if I was hungry. I wasn’t, so I chose not to eat seconds. I plan limit my caffeine to one cup of coffee a day, and to stay off sugar, soda, and processed foods and continue to lose weight. I am really glad I did this cleanse. Not just for the physical detox, but for the emotional detox as well. This was a good re-set for my body and my heart. Posted in Dealing with the Mess and tagged addict, clean eating, cleanse, connection, detox, diverticulitis, eating disorders, food, food addiction, green, healthy eating, hungry, moving, smoothie, weight loss on March 13, 2016 by Kristin Meador. 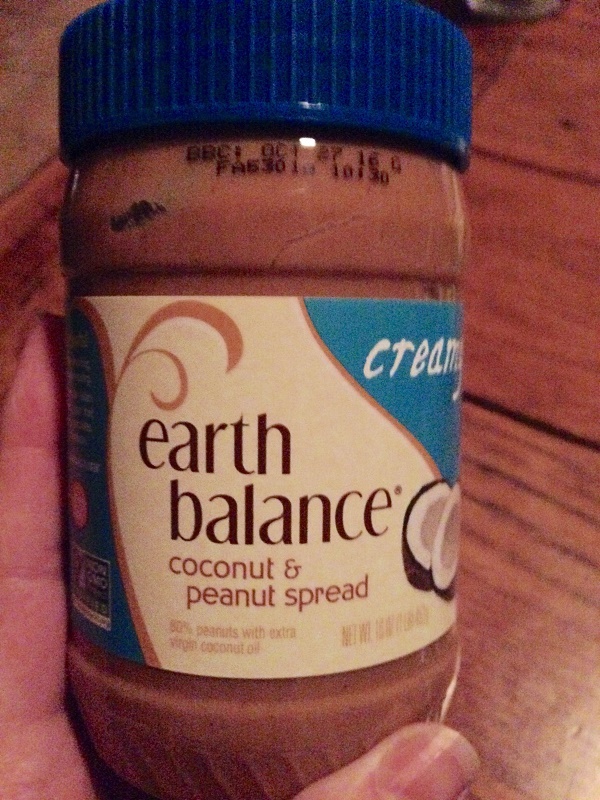 First, let me tell you the most important thing: My new favorite product – Earth Balance Creamy Coconut and Peanut Spread. It is non-GMO, vegan, and no trans fat. No added sugar, but there are 2 grams of sugars per serving (2 tablespoons). It is the best nut butter I’ve ever had that isn’t Nutella. So if you are looking for something delicious with no added sugar, give it a try. Unsweetened peanut butter is an allowed snack during the smoothie cleanse, you just need to watch quantities. I had a tablespoon with an apple today. *Disclaimer – this information is not intended to be taken as medical advice, I am simply sharing my personal experience. Please consult with your physician before doing a cleanse or choosing a laxative. Don’t worry – I am not going to post an update of every single day of this cleanse, but I thought I would answer the messages I’ve been getting asking me how today is going. If you want to read about my rough start to the 10-Day Green Smoothie Cleanse, click here. I will post again on days 5 and 10. And now onto the progress of the day. Long story short, I stuck with the plan all day today, and barely drank all 3 liters of my water. Woke up late but weighed on time – lost 1.4 lbs which is not unexpected due to the amount of water I drank yesterday. So lost 20 ounces of water weight. Started to make my smoothie but it started snowing big, white, beautiful flake so had to run outside and take pictures. Slow start getting ready this morning, but made my smoothie for the day and put my water for the day in a pitcher. Had an eye appointment so didn’t want to drink too much water first thing this morning. Had my eyes dilated, and I’m very sensitive to the eye dilation. After I came home I got a horrible headache and became nauseated. I’m not sure if this was due only to the dilation or if it was also still caffeine withdrawal, so I took an Excedrin migraine and took a nap, which helped a bit. DRINKING MAGNESIUM CITRATE: Chill the bottle of magnesium citrate. I chose one with a lemon flavor. Make sure it is well-chilled, and drink it quickly. It doesn’t seem to taste that bad at first, but the aftertaste is horrible. I try to drink one bottle in two swallows, and chase it with something that has good flavor, like juice. In my experience, mag citrate makes me a bit nauseated, so I try to make sure that I don’t have anywhere to go (you don’t want to be far from a bathroom anyway, because LAXATIVE), and not too much in my stomach. I also don’t like taking it on an empty stomach. I find that I feel better if I don’t lay down after taking it. I am less nauseated if I am partly sitting up. I also find that I can get chilled after drinking chilled solution quickly, so I will sit on with extra blankets until the chill passes. That can also contribute to the nausea. I drank the mag citrate at about 3:30 pm and it started working in about 90 minutes, and the effects lasted about 4-5 hours. If you have food in your stomach, it will go slower. If you have been on clear liquids, your colon will clean out faster. It can take anywhere from 30 minutes to 4-5 hours to start working, depending upon the person. When it starts working, you will want to be near a bathroom, because you will start having multiple stools. To protect your skin, you may want to use soft wipes and protective cream like Desitin. (This is particularly important when you are prepping for a colonoscopy, which is much more involved than just one bottle of mag citrate). Click here for more info on magnesium citrate. The rest of the day was spent trying to rid myself of nausea and a headache, and taking trips to the bathroom. I have to say, I was not hungry at all today. I ate a few snacks, and I followed the book’s suggestion of ‘chewing’ your smoothie, which helped trick my brain and satisfied my desire for solid food. Tomorrow my day is going to get back to normal – I have a house to clean and projects to work on. The challenge will be drinking all the water and peeing often. In summary, Day Two was a success, and I’m on my way. I just have to think about one day at a time, because if I think of TEN DAYS, it’s too overwhelming.